The wait is finally over and as football lovers, it is time to rub our hands together as we wait to see which team will carry the day in the EPL at the end of the season. First off, comes Machester United United Vs Leicester to open the campaign for us; Goals from Paul Pogba from the spot and Luke Shaw's second-half strike at Old Trafford calmed the nerves of the un-easy United supporters. Here's how the players performed. Was alert throughout the match and showed why United was never going to entertain any offer for him. His save for Maddison's effort assured fans that the team will be in safe hands during the season. Unlucky not to keep a clean sheet though. Not by far the most loved player at Old Trafford but did well in this game. Was given a run throughout the game but, recovered well. Should really build on this performance if he wants a future at United. What more can you want when you have such a colossal figure leading your defence? Further enhanced his reputation and he should be the first name on the team sheet when fit this season. Is he finally living up to the potential that convinced Mourinho to spend 30 million to get him? We'll have to wait and see. But on this performance, he should be Bailly's partner for the season. Seems to have carried his world cup form back to Manchester United. 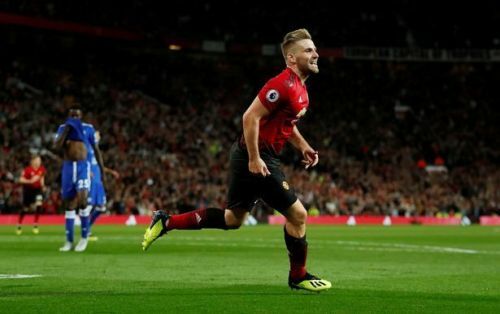 Luke Shaw is fighting for his United carrier he put in a couple of tackles and was generally solid. His attitude from the onset was amazing and will please his manager. Maybe the sting of being overlooked for club and country for an older winger turned defender is finally getting to him - in a good way. His goal was just the icing on the cake. Too eager to impress from the summer signing. Looks like a good buy from the boss and will only get better. Too rush on the tackle though and was lucky not to see red in this game. Should be more careful. His tireless work will only endear him more to the Old Trafford faithful. After spending two seasons on loan, the penny seems to have finally dropped on one of the most exciting players to watch at United. Andreas was simply outstanding in the holding role of the midfield three. Such an intelligent player and started off most of the United counter attacks. Are we going to seeing him come to his own? Maybe. Pirlo comparisons may be too early, but on current form, he won't escape them. Huge fuss has been made about him in the last week but that didn't stop the world cup winning mid-fielder from bossing this game. On current form, you may see why Barcelona were so eager to get and why United couldn't let that happen. The Signing of Fred will only un-shackle this great talent. He's in the mood, and we are in for a treat this season from this guy. Man of the Match. We all know his touch is impeccable and he will work for the team. On this account though, he needs to do more to stay in the team. He did set up the winner for Shaw, however with a clever ball. He also contributed in defence when Darmain was being overwhelmed. Given the number 10 jersey for this season, a number worn by Rooney, Sheringham, Van Nistelrooy and the great Sir Bobby. Is the number weighing on him already? Mourinho didn't hand him that number only for him to sit on the bench! Needs to up his game if he's to live up to his potential and that number. It will be wrong to judge him on this single performance but surely, fans expect more from Sanchez. He did win the penalty that Pogba scored but other than that, there's not much to write home about. Needs to start showing more of the player that United thought they were buying. After the world cup performances by the big Belgian fans would have been expecting more from him. Well, he disappointed.